Macarons are still incredibly popular, they’re great with a cup of tea or a strong coffee, make an excellent cake decoration and can themselves be the centre of attention. Best of all, they can be made ahead of time and are one of the few foods that gets better after being frozen or left in a biscuit barrel for a couple of days. A perfect macaron should be just set in the middle, with a soft and very slightly chewy centre and a thin layer of crispy outer shell. The surface should be smooth, almost shiny, and a macaron must have a clean “foot” where it expands and rises up from the tray while as it cooks, and it shouldn’t have large hollows or any cracks on the top surface. I love making macarons. I have tried several different recipes and methods, this is my recipe and the tips I have picked up through a lot of research and testing. I prefer to use a slightly modified Italian meringue macaron (hot sugar) recipe with a few tweaks that actively prevent failures and result in a much more stable mix and reliable result. I used to like using the French meringue macaron method (dry sugar whipped into raw egg whites), it’s easier but, I found it’s less reliable and can be affected too easily by humidity and other variables. The French method also takes me longer due to the time it takes for the sugar to dissolve when making the meringue and the finished product breaks down a bit too easily in humidity. The majority of macaron recipes I’ve tried are either too small or make a nearly commercial quantity of macaron shells making the mix a little hard to work with. Larger batches normally need at least 6 or 8 large biscuit trays on hand and enough space to stack them while they form a skin prior to baking them. The issue with working with such a large quantity (standard amount for most recipes) is that once the almond meal is added to the meringue, the fat in the almonds begins to break down the meringue and can continue to do so the longer it is in contact. I do occasionally do double batches, but the larger amounts are slightly harder to get perfect. Macaron shells are usually bland and very sweet, I like to put flavours on the outside of the macarons as well. A sprinkling of salted, ground, roasted nuts adds interest and gives a bit of a flavour burst, a dusting of cocoa or instant coffee pushed through a sieve and sprinkled on one side of the shells also looks nice and adds to the flavour. The shells can have additional flavour added by adding a few drops of flavoured oil or essences like the ones used for chocolate and candy making. Or some of the almond meal can be replaced with ground hazelnuts or pistachios, or a small amount of freeze dried fruit powder or cocoa powder. All the flavour of a macaron usually comes from the fillings, Jam and/or basic buttercream are the traditional fillings for macarons. Fillings are usually better if they are tart, salty or bitter to help balance out the sweetness of the shells. Salted caramel and roasted salted pistachio both make really great fillings, the salt boosts the flavour of the fillings, but also cuts the sweetness of the shells. Ganache is by far the most popular filling, dark and semi-dark chocolate ganache work well against the Macaron shells. White chocolate I would ordinarily find too sweet to be used in a Macaron, so I like to use sour cream salted white chocolate ganache with a low sugar sour berry jam or fruit filling. Sour cream in the ganache makes it taste similar to cheesecake. 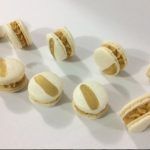 The sour cream white chocolate ganache recipe included below the macaron recipe is very versatile as it’s not too sweet and can be used to ganache or fill a cake and even works well under fondant. Digital scale – this is an essential tool for making macarons. 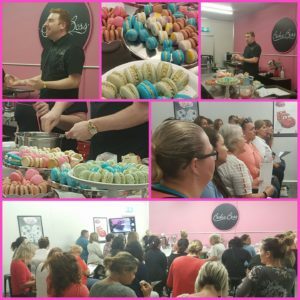 Stand mixer – I have made macarons by hand just with a whisk, but I really don’t recommend it… it’s pretty hard going even with electric handheld beaters. 3x very large biscuit baking trays, lined with baking paper. This arrangement, instead of a silicone mat helps to cook macarons from the bottom faster, allowing a softer middle, cleaner more evenly cooked foot and easier removal from the paper. 1x small electric desk fan or a smallish pedestal fan – I use a 10cm Metal Desk Fan I got at Bunnings – this speeds up the curing process and helps to ensure a good skin forms on the top of the macarons, if the surface does not form a skin the tops will crack and the macarons will not form the “feet” that add to their appeal. A splash of vinegar, for wiping over the mixer’s bowl and whisk. Preheat a fan forced oven to 145 celsius. Wipe over the bowl of the stand mixer with vinegar and a paper towel, this helps to stabilise the egg whites. Weigh 150 grams of caster sugar and 37 grams of water into a medium-sized heavy based pot. Attach 2 glass sugar thermometers to opposite sides of the pan, make sure the tip of the thermometers is in the sugar but not in contact with the base of the pot. 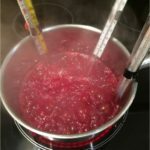 I use at least two thermometers as the sugar syrup will heat at different speeds even across a small high-quality saucepan, it also helps identify if one thermometer slips down to contact the base of the pot and gives a falsely high reading. Heat over a high heat on the stove top, do not stir, but it helps to gently swirl the contents of the bowl once to equal out the heat when it starts to get close to boiling, but do not get it up the sides of the pot or it will cause the syrup to crystallise prematurely. Later the sugar will need to be taken off the heat just before it hits 118 degrees. It heats up fast, so it needs to be watched closely once it starts boiling. While the sugar is heating, quickly separate and weigh out 110 grams of egg whites and place in the stand mixer fitted with a whisk attachment. If it is the first time making this recipe, or if you’re not good at separating eggs under pressure, weigh out the egg whites at the start, before heating the sugar. When the sugar gets to about 110 degrees celsius turn the stand mixer on high speed to begin aerating the egg whites, they should have started to form soft peaks before adding the sugar. When the sugar hits 117 degrees celsius take it off the heat, a heavy based pan will continue to cook the sugar for a little while after the pot is off the heat, it will heat to desired 118 degrees on its own. 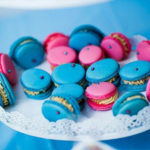 The sugar must get to between 117 and 120 degrees; any less and the mix will be too runny and the macarons won’t form a skin as easily, any more and they will cook unpredictably. In the meantime the egg white should be starting to form soft peaks, with the stand mixer still whipping the egg whites, slowly pour the hot sugar syrup into the egg whites in a very thin stream. Continue mixing on high until it cools a little, continue mixing until the meringue will form stiff peaks, then stop. Do not over beat as this will weaken the meringue and result in a higher probability of hollows in the shells. The balloon whisk attachment should be able to pull out a peak of meringue that holds its shape when it’s turned upside down. While the meringue is still mixing and cooling, sift together 150 grams of pure icing sugar and 150 grams of almond meal in a large bowl. There will be a few grains of less milled almond meal left over, discard these and continue adding almond meal until you have exactly 150 grams of sifted almond meal. For a smoother shiner looking macaron, the meal and icing sugar can be further milled in a food processor for between 20 seconds and a minute to make the almond meal finer. The extra step in the food processor is not necessary, most almond meal is already pretty fine, but it does give a better smoother finish to the resulting macaron shell. When the meringue has cooled to a point where it is warm to the touch but not hot, mix a third of the meringue into the almond/icing sugar mixture and work into a thick paste using a spatula. Add another third of the meringue to the almond paste, continue to mix until the almond and meringue are combined smoothly. Gently fold the remaining meringue into the almond meal, continue gently folding the mixtures until there are no separate streaks of almond paste or meringue. If you want two colours in one batch separate the mixture into two small bowls, add a few drops of gel paste colour to each half. Continue mixing with the spatula to deflate it until it has a lava-like consistency, it should very slowly flow from a spatula when lifted out, but not be runny. This is the part of macaron making that requires practice, too much mixing will give a thin batter and result in thin crunchy macarons, not enough mixing and it will be too thick, resulting in a rough surface on the macaron and the inside will be filled with large air pockets. 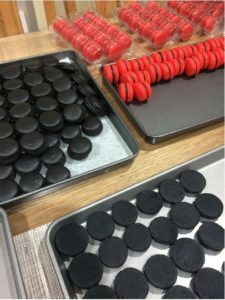 If the consistency is correct before piping, the resulting surface of the macarons will be shiny, very lightly crunchy and the inside will be delicately soft, gently chewy and not too dense. Line 3 large biscuit trays with baking paper, cut to size so that it lays flat. Slide printed macaron guides under the baking paper, this helps ensure the macarons are all piped the same size with even spacing. 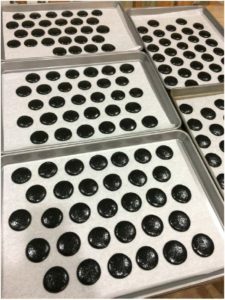 Fill piping bags fitted with 10ml round pastry tubes with the macaron mixture and pipe onto the trays following the guides. Try to avoid leaving any “peaks”, round off peaks on the surface with the back of a spoon or with a fingertip dipped in water. Place macaron trays to one side, arrange a small fan so that there is airflow over all the macarons. This will force them to form a skin, ensuring the macarons rise and form “feet” correctly. Leave the macarons under the fan for at least 10 minutes or until the surface is dull and not sticky to the touch. Bake the macarons in an oven preheated to 140 -145 degrees Celcius for 14 minutes or until there are no dark patches on the bottom of the macaron, check this by lifting a corner of the baking paper to look at the underside of the macaron through the paper. I test to see if they are done by gently nudging the top of a couple of them sideways, if they resist, they are done. Cool on the tray. If they are moved before they are cool, the foot and insides of the macaron will stick to the baking paper. Brush the macarons with lustre dust or paint them, this can be done while they are still on the paper. Leave them for five minutes to cool, turn the paper over then peel the paper from the macarons. Pair up similar sized halves and pipe buttercream onto half of the macaron shells using a large fine star piping tip. Place the other half on top to form completed macarons. 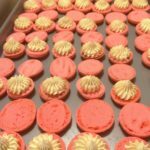 While the macaron shells are resting under the fan and while they are cooking, prepare the buttercream fillings, like pistachio buttercream and salted caramel buttercream. When I started out making macarons I had several failures. Now I can get tray after tray of perfect macarons every time. I’m frugal and very time poor, I can’t afford to have a failed batch. 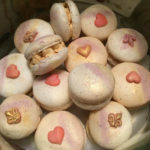 Here is a brief list of what can go wrong and how to avoid issues, there are benefits to making French macarons, but I found that external factors affect them more than Italian meringue macarons, so using the Italian method is a good place to start. Warm or cold eggs make absolutely no difference at all, older eggs do whip faster and create slightly more volume than fresh ones, but not so much that it makes a difference to the Italian meringue method recipe. My recipe whips more air in than is needed, so any variation in egg freshness is negated. Weigh everything! – the ratios are important, working by weight eliminates variations that can cause errors. Don’t whip the meringue in a plastic bowl, use a clean glass or metal bowl wiped over with vinegar, the vinegar stabilises the egg whites. A pinch of salt or a pinch of cream of tartar has a similar effect. The meringue must be mixed until it forms glossy stiff peaks. It should not be whipped past stiff peaks. If the meringue is over whipped it becomes dry and firm like set marshmallow and will increase the likelihood of hollow shells. The meringue can be warm, but it should not be hot before adding it to the almond meal. If it is too hot, the fat in the almond meal will break it down too fast and make the mixture turn sloppy. The consistency of the mixture before piping is incredibly important. Working the almond and meringue mixture to break it down to the right consistency is called Macaronage. This mixing is important to get the right texture inside the macaron and getting a smooth shell. Just prior to loading the finished mixture into a piping bag it should have a “lava-like” consistency, kind of like wet cement, you should be able to lift a large amount out of the bowl with a spatula and it should slowly flow off the spatula and drop back into the bowl. 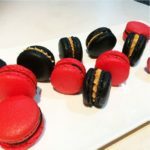 If the mix is too stiff the resulting macarons will have rough tops with pointed peaks, too thin and they won’t form a skin easily and will spread too much. I cheat the original recipe a bit, with my recipe I don’t split the egg whites – I don’t work half of the raw egg whites into the almond meal – instead I whip all the egg whites then pour in the hot sugar syrup. Using all the egg at the whipping stage creates more volume and less sugar splatter. More aerated eggwhites mean the resulting mixture needs more mixing to get it to a slow flowing “lava” like state, but it also gives much longer time to work with and pipe the final mix. Not giving the macarons time to form a skin, is one of the main reasons Italian meringue macarons fail. The tops must be dry to the touch (no longer sticky) or they will not form “feet”. If they aren’t dry on top, the tops of the shells will burst apart while baking or the shells will have large hollows. My house is usually warm and humid, some days it could take an hour to form a skin, or they may just not… To speed up the process and guarantee a skin on top I put the trays in front of a desk fan. The fast-moving air dries the tops out in around ten to fifteen minutes and is a large part of why even if I mess up the sugar stage, I still get a great result. French method macarons aren’t supposed to need the skin to form, but they benefit from the same treatment as the Italians method. The other reason that Italian meringue macarons fail is the temperature of the sugar, use two, (or three) thermometers on different sides of the saucepan and keep the tips from touching the bottom. Take off the heat at 117 degrees and immediately start to pour it into the eggwhites in a slow thin stream, the temperature will continue to rise the extra degree in the pot while it is being poured. Don’t over heat and don’t under heat either scenario will result in issues. Don’t ever stir the sugar while it’s cooking this will cause it to crystallise. 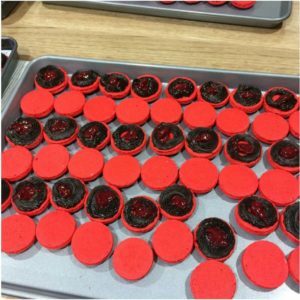 Do not cook on a thick or poor quality silicone mat, these mats block the heat required to seal off the bottom of the macaron and will usually result in over baked macarons. Baking paper on a baking tray gives the best result by far, if you do use a silicone mat, then use a very thin high-quality mat or Silpat. If you are getting big hollows in the macaron, you’ve over whipped the meringue after adding the sugar or the oven is too hot. Turn the oven down by a few degrees or try cooking on a lower shelf in the oven, this of course depends on your oven. If the macarons are too dense or don’t develop feet increase the temperature by a few degrees. 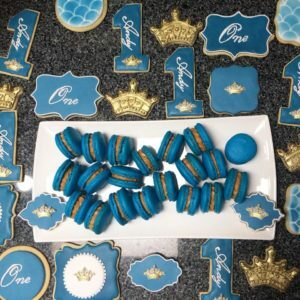 This one was a bit of a surprise to me, but it is possible to make nut free macarons by directly replacing the almond meal with pepitas, (pumpkin seed kernals). Weigh out the pepitas and icing sugar and blend them together to get a fine mixture using a food processor. Sift out and reprocess anything that doesn’t go through the sieve. Weigh out any left overs and process and equivalent to replace and ensure you have the exact amount of pepita flour that you need for the recipe. This makes a wonderfully flavoursome, if somewhat browny-green macaron shell and behaves almost identically to almond meal. 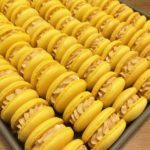 It is possible to make egg free macarons using the french method with aquafaba (juice from canned chick peas), and I have heard several reports of people having great success with this, but I am yet to experiment with egg free macarons. When I have time later this year I’ll experiment to get a stable egg free recipe as well, but this will take me a fair amount of time. Roughly 100grams of butter cubed. Approx 5 tablespoons of icing sugar, to taste. 200grams of roasted, salted pistachio kernels ground to a paste. 1/2 Teaspoon Concentrated natural vanilla extract. Grind the pistachios to a fine powder in a food processor or spice grinder, sift out any large pieces. Add ground pistachio to a small deep mixing bowl with roughly half of the cubes of butter and mix with electric hand beaters until a creamed together. Add more butter if needed to adjust the texture, mix in 1 tablespoon of icing sugar and a small pinch of crushed salt flakes and a little less than ¼ teaspoon of vanilla extract, mix and taste. Add more sugar until the desired sweetness is reached, continue beating to ensure the sugar is all dissolved. Finish by adding another few pinches of gently crushed salt flakes. Set aside in a fridge to firm up slightly, whip quickly for a few seconds to get it back to a texture that can be piped. Icing sugar 4 -5 tablespoons adjust to suit taste, compensate for the bitter caramel and provide stability. Pour enough sugar into the bottom of a heavy based pan to cover the base to a depth of about 2mm. Cook dry sugar over high heat to form caramel, stir to ensure even cooking. Cook until a deep golden colour is reached, then take off the heat, continue to let the residual heat from the pot cook the caramel, let it darken to a deep red colour, you might need to put it back on the heat briefly. Just as the desired colour is reached pour in cream and whisk vigorously for a few minutes to take some of the heat out of the caramel, be careful as this needs to be done quickly and the cream will boil violently. Add half the butter and stir until the melted. Transfer caramel to a large tray to help it cool faster. Place in the fridge, or freezer to accelerate the process. Once the caramel is cold, transfer it to a small deep mixing bowl whip until the colour goes pale brown using and electric hand beater. The caramel should be very bitter and not sweet, so icing sugar is added to sweeten and stabilise the mix. Add about ¼ teaspoon of vanilla and mix until light and fluffy, continue to mix, adding the butter to improve the texture. Add more sugar to balance the bitterness of the caramel until the desired flavour is achieved. Crush a few pinches of salt flakes in the palm of your hand, add to the buttercream, mix very briefly then taste, add more salt if needed. Set aside in a fridge to firm up slightly, whip for a for a few seconds before using. 1 part sour cream to 3 parts white chocolate, a 1tsp of apple cider vinegar or lemon juice and a half teaspoon of fine table salt. I usually make 600g white chocolate, 200 g sour cream (full fat). 1 tablespoon lemon juice, 1/2 teaspoon vanilla extract and about half a teaspoon of fine table salt. Just heat them all together in the microwave in 30 second bursts mixing all the time until it comes together (roughly 2 and a half minutes in total) then chill until it has a thick spreadable consistency. This is enough to cover and fill a double barrel 8″ cake or fill a couple of hundred macarons. I generally freeze the left over ganache from when I’m makingcakes to use it in macarons the following week. 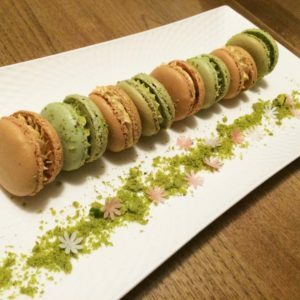 Extensively tested, detailed recipe complete with tips to ensure perfect macarons. Includes salted caramel and pistachio buttercream recipes and a recipe for lightly salted sour cream white chocolate ganache. Tips in the notes below the recipe. A splash of vinegar, for wiping over the mixer's bowl and whisk. 200grams of pistachios ground to a paste. ¼ Teaspoon Concentrated natural vanilla extract. 1 part sour cream to 3 parts white chocolate, a touch of lemon juice and a large pinch of salt. Preheat oven to 145 celsius. Into a medium sized heavy based pot weigh 150grams of caster sugar and 37grams of water. Attach 2 glass sugar thermometers to opposite sides of the pan, make sure the tip of the thermometers is in the sugar but not in contact with the base of the pot. I use two thermometers, as the sugar mix will often heat at different speeds on each side of the pot, even in a small pot, and it helps if one thermometer slips down to contact the base of the pot and gives a falsely high reading. Heat on a high heat on the stove, do not stir, but you may want to gently swirl the contents of the bowl to equal out the heat. Later the sugar will need to be taken off the heat and slowly streamed into the eggs when it hits 118 degrees. It heats up fast, so it needs to be watched. While the sugar is heating, quickly wipe over the bowl of the stand mixer vinegar and a paper towel, this helps to stabilise the egg whites. Separate and weigh out 110 grams of egg whites and place in the stand mixer fitted with a whisk attachment, add a pinch of salt. Do not get any yolk in the whites or you will need to start again. You will probably want to weigh out the egg whites at the start before heating the sugar if it is the first time making this recipe. When the sugar gets to about 110 degrees celsius turn the stand mixer on high speed to begin aerating the egg whites. When the sugar hits 117 degrees celsius take it off the heat, a heavy based pan will continue to cook the sugar for a little while after the pot is off the heat, it will continue to heat to 118 degrees on its own. The sugar must get to between 118 and 122 degrees. any less and the mix will be too runny and the macarons won't form a skin, any more and it will cook unpredictably. In the meantime the egg white should be starting to form soft peaks, with the stand mixer still whipping the egg whites, slowly pour the hot sugar syrup into the egg whites in a very thin stream. 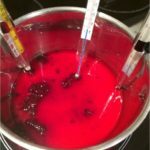 Continue mixing on high until it cools to about 50 degrees C, less is preferable - usually takes at least seven minutes. You need a dryish, glossy meringue, if it is still bubbly looking like a coarse marshmallow, it needs to be whipped more. While the meringue is whipping and cooling, sift together 150 grams of pure icing sugar and 150 grams of almond meal in a separate bowl. There will be a few larger grains of almond meal left over, discard these and continue adding almond meal until you have exactly 150 grams of sifted almond meal. When the meringue has cooled, mix a third of the meringue into the almond mixture and work into a thick paste using a spatula. Add another third of the meringue to the almond paste mix, continue to mix until the almond paste and meringue are combined smoothly. Fold the remaining meringue into the almond meal, continue gently folding the mixtures until there are no separate streaks of almond paste or meringue. Separate the mixture into two small bowls, add a small amount of gel paste colour to each half. Then continue mixing with the spatula to deflate it until it has a lava like consistency, it should very slowly flow from a spatula when lifted out, but not be runny. This is the part of macaron making that requires practice, too much mixing will give a thin batter and result in thin crunchy macarons, or cracked tops not enough mixing and it will be too thick, resulting in a rough surface on the macaron and the inside will be filled with large air pockets. If the consistency is correct before piping, the surface of the end product will be shiny, very lightly crunchy and the inside will be delicately soft, and gently chewy, but not too dense. Line two large cookie trays with baking paper, cut to size so that it lays flat. Slide printed macaron guides under the baking paper, this helps ensure the macarons are all piped the same size. 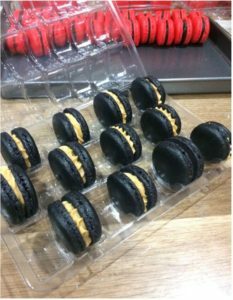 Fill piping bags fitted with 10ml round pastry tubes with the macaron mixture and pipe onto the trays following the guides. Try to avoid leaving any "peaks", round off the surface with the back of a spoon if there are any. Place macaron trays to dry the tops, arrange a small fan so that there is direct airflow over all the macarons. 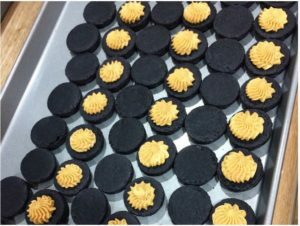 This will help them to form a skin, which is essential to ensuring the macarons rise and form “feet” correctly. Leave the macarons under the fan for at least 10 minutes or until the surface is dull and not sticky to the touch. Bake the macarons in an oven preheated to 140 -145 degrees Celcius for 14 minutes or until there are no dark patches on the bottom of the macaron, check this by lifting a corner of the baking paper to look at the underside of the macaron through the paper.I test to see if they are done by nudging them sideways a little, if they resist they are done, if the whole top shifts with no resistance they need another couple of minutes. Cool on the tray. Brush the macarons with lustre dust or paint them, this can be done while they are still on the paper. Leave them for five minutes to cool, turn the paper over then peel the paper from the macarons. Pair up similar sized halves and pipe buttercream onto half of the macaron shells using a large fine star piping tip. Place the other half on top to form completed macarons. 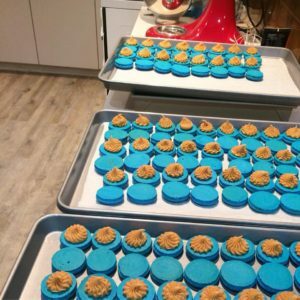 While the macaron shells are resting under the fan and then cooking, prepare the butter cream fillings, these will be pistachio buttercream and salted caramel buttercream. Grind roasted salted pistachios to a fine powder, sift out any large pieces. Add the powder back to the grinder and grind until it forms a thick paste. Add paste to a small deep mixing bowl with roughly half of the cubes of butter and mix with electric hand beaters until a creamed together. Add more butter if needed to adjust the texture, mix in 1 tablespoon of icing sugar and a small pinch of crush salt flakes and a little less than ¼ teaspoon of vanilla extract, mix and taste. Add more sugar until desired sweetness/firmness is reached, continue beating to ensure the sugar is all dissolved. Finish by adding another few pinches of gently crushed salt flakes to taste. Cook dry sugar over high heat to form caramel, stir to ensure even cooking. Cook until a golden colour, then take off the heat, continue to let the residual heat from the pot cook the caramel, let it darken to a deep red colour, you might need to put it back on the heat briefly. Just as the desired colour is reached pour in cream and whisk vigorously for a few minutes to take some of the heat out of the caramel, Add the butter and stir until the butter is melted. Transfer caramel to a large tray to help it cool faster. Place in the fridge, or freezer to accelerate the process. Once the caramel is cold, use a bench scarper to transfer it to a small deep mixing bowl whip until the colour goes pale brown using and electric hand beater. The caramel should be bitter, so icing sugar is added to sweeten and stabilise the mix. Add about ¼ teaspoon of vanilla and mix until light and fluffy, continue to mix adding icing sugar and butter until the correct texture is achieved. Add more sugar to balance the bitterness of the caramel until the desired flavour is achieved. Crush salt flakes in the palm of your hand and mix in very briefly then taste, add more salt if needed. I usually make 600g white chocolate, 200 g sour cream (full fat). 1 tablespoon lemon juice, 1/2 teaspoon vanilla extract and about half a teaspoon of salt flakes. Just heat them all together in the microwave in 30 second bursts mixing all the time until it comes together then chill until it has a thick spreadable consistency. Weigh everything! - the ratios are important. Don't whip the meringue in a plastic bowl, use a clean glass or metal bowl wiped over with vinegar, the vinegar stabilises the egg whites. The meringue has to be mixed until it is dryish and glossy. It needs to cool to just above body temperature before adding it to the almond meal. If it is too hot, the fat in the almond meal will break it down too fast. The consistency of the mixture is incredibly important. Working the almond and meringue mixture to break it down to the right consistency is called Macaronage, it is important to getting the right texture inside the macaron and to getting a smooth shell. Do not over mix it, it should never be runny. The "finished" mix, just prior to loading it into a piping bag should have a "lava-like" consistency, kind of like wet cement, you should be able to lift a large amount out of the bowl with a spatula and it should very slowly flow back into the bowl. 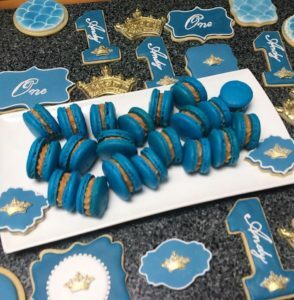 If the mix is too stiff the resulting macarons will have rough tops with pointed peaks, too thin and they won't form a skin and will spread too much. I cheat the original recipe a bit, with my recipe I don't split the egg whites - I don't work half of the raw egg whites into the almond meal, I whip all of the egg whites then pour in the hot sugar syrup. Using more egg at the whipping stage means you get more volume and don't get as much sugar splatter. You have to mix the meringue for a little longer, until it's cool or it will set firm instead of being glossy and smooth, but I find it easier just to add meringue in steps to the almond meal/icing sugar mix. It means you've got to work the resulting mixture more to get it to a flowing "lava" like state, but also gives you a much longer time to work with the final mix. Not giving the macarons time to form a skin, is one of the main reasons for failure. The tops must be dry to the touch or they will not form "feet". If they aren't dry on top, the tops of the shells will burst apart while baking or have large hollows. My house is usually warm and humid, some days it could take an hour to form a skin, or they may just not... To speed up and guarantee I get a skin on top I put the trays in front of a desk fan. The fast moving air dries the tops out in around ten minutes and is a large part of why even if I mess up the sugar stage, I still usually get a great result. Do not cook on a thick silicone mat, these mats block the heat required to seal off the bottom of the macaron and will usually result in over baked macarons. Baking paper on a dark baking tray gives the best result by far, if you do use a silicone mat, then use a very thin high-quality mat. All the flavour of a macaron usually comes from the fillings, Jam and/or Classic crusting buttercream are the traditional fillings for macarons. These fillings are usually better if they are tart, salty or bitter to help balance out the sweetness of the shells and fillings. This is why salted caramel and pistachio both make really great fillings, the salt levels boost the flavour of the fillings, but also cuts the sweetness of the shells. Ganache is by far the most popular filling, dark and semi-dark chocolate ganache work well against the Macaron shells. White chocolate I would ordinarily find too sweet to be piped in a larger quantity in a Macaron. This is why I like to use sour cream salted white chocolate ganache and a tart berry jam filling, it makes the macarons taste similar to cheescake. The sour cream white chocolate ganache recipe included below the macaron recipe is very versatile and can be used to ganache or fill a cake and works well under fondant. Using a basic aerated buttercream allows a lot more filling to be piped onto the macarons and gives a much more pleasing visual effect, it can also have a more pleasant mouthfeel and is usually less sweet than white chocolate ganache or Italian meringue buttercream. Digital scale - this is an essential tool for making macarons. 3x large cookie pans, (approx 48.5x30.8cm). 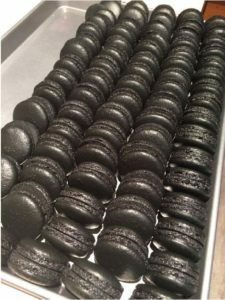 Dark heavier metal is preferable to aluminium, it helps cook macarons from the bottom faster, allowing a softer middle, cleaner more evenly cooked foot and easier removal from the paper. 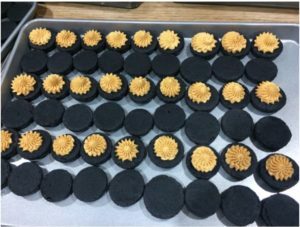 1x small electric desk fan – I use a 10cm Metal Desk Fan, I got at Bunnings - this speeds up the curing process and helps to ensure a good skin forms on the top of the macarons, if the surface does not form a skin the tops will crack and the macarons will not form the "feet" that add to their appeal.